Whew! That’s that! Hope you enjoyed it! I’m at this point in my comic “career” where I have at least a vague idea of what makes me happy. Frankly, I like drawing these story arcs. Frankly, I’d like to try my hand at a longer-form story arc. Y’know? This tale was fun, but I feel bad for having to shove it into 7 pages. Maybe this could have been done better if it had been longer? What am I saying, of course it could have. Anyway, I’m satisfied with it and I look forward to the next 93 comics before the next one! Thanks for reading, Bits and Bytes! Ooooverwatch! Iiiiii like Overwatch! Thiiiiis time could be spent playing Overwatch! I’m gonna do an indoor campout with the girls tonight. We’re doin’ the whole thing: Snacks, smores, sleeping bags and– oh wait, we’re not going outside because outside is awful. And we’re gonna read Goosebumps books! I might be the most excited about tonight. Ah, you think the shrieking is your ally. But you only adopted the call. I was born in it. Molded by it. I didn’t hear silence in till I was already a man, and by then, it was nothing more than deafening! I thought for sure there was going to be more Dragonball jokes. But, I was sadly disappointed. Maybe we’ll see more, NEXT TIME ON DRAGONBALL Z! I’ve read this some time ago but wanted to just say that this was an adorable story. Dad & Daughter Team is Awesome! The story is really fun. 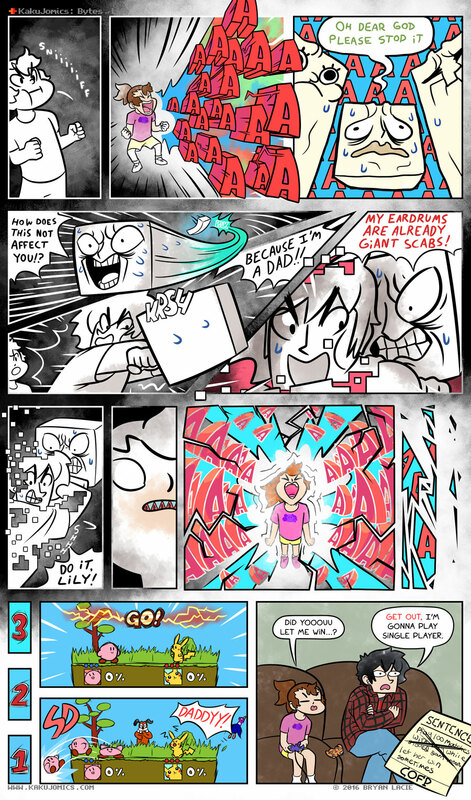 The plethora of facial expressions are classic (I stared quite a bit at the 5th frame here, where Lily’s about to go Super Nova)! Kudos! Looking forward to your future works!